Tunebite Platinum - Legally remove DRM copy protection from music, audio books & videos by re-recording at up to 54x the speed. 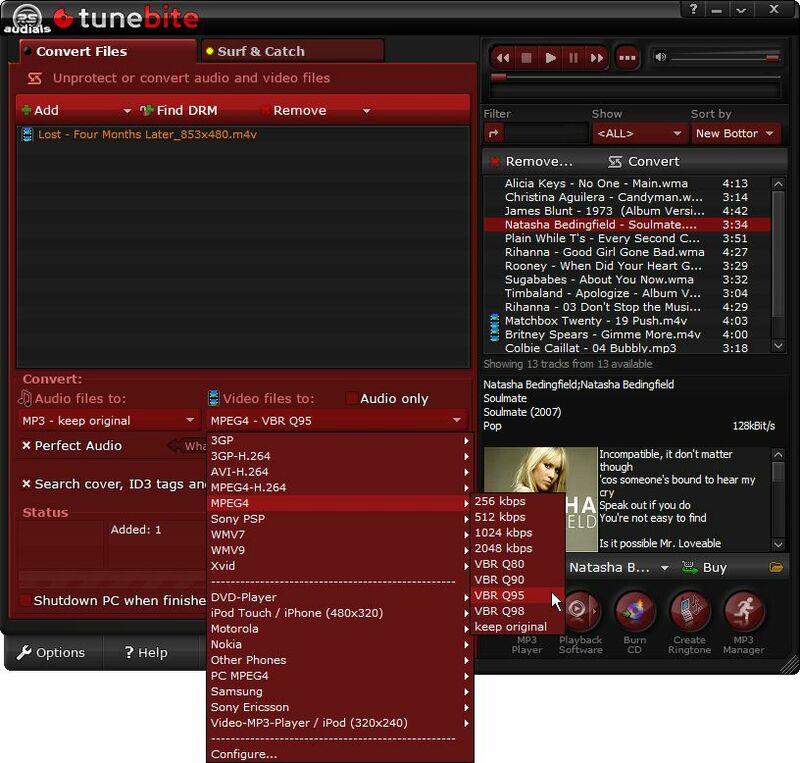 use the virtual CD-burner with Tunebite Platinum. Digital 'PerfectAudio' quality control. Universal converter for 100 audio & video file formats for every device. Lots of extras: a web recorder that converts web radio (e.g Last.fm) audio recordings, a video recorder for video portals (e,g, Youtube), ID3 tags & more! With either the playback software or Tunebite Platinum, additional copyrighted music & audio book files can be copied by using the virtual CD-burner. Tunebite has one of a kind quality control with PerfectAudio, guaranteeing error-free audio output. Tunebite turns the PC into a high-performance, Video DRM converter and ensures the synchronicity of video & audio while the copyrighted video files are played back. In the process, Tunebite legally photographs, frame by frame, the replayed, copyrighted films & saves them in the desired format. Tunebite informs you of the expected output quality of the files to be converted based on the operating system and PC performance & also warns of a loss in quality before converting files on PCs with weaker performance. Qweas is providing links to Tunebite Platinum 9 as a courtesy, and makes no representations regarding Tunebite Platinum or any other applications or any information related thereto. Any questions, complaints or claims regarding this application Tunebite Platinum 9 must be directed to the appropriate software vendor. You may click the publisher link of Tunebite Platinum on the top of this page to get more details about the vendor.